Our office is bursting with energy and activity as the National Youth Choral Festival nears. 416 students will arrive on Friday and we'll greet them with a mini-concert on Friday evening. 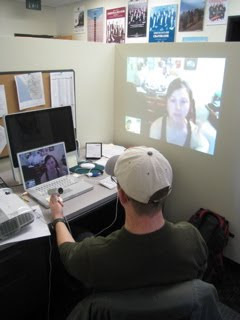 Education Director Ben (with his wife helping him) is working out the Skype hookup which will be used for a conference with composer Michael McGlynn - on the biggest screen we can organize. This way, the singers about to sing Michael's piece Si do Mahaimeo will be able to meet the composer and hear his thoughts. Michael is going to get up in the middle of the night in Ireland to do it!